President Donald Trump has picked Lafayette lawyer Donald Washington to be director of the U.S. Marshals Service. 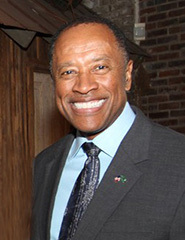 A former U.S. attorney for the Western District of Louisiana. The Marshals Service is the country's oldest federal law enforcement agency and employs more than 3,500 deputy marshals and investigators as well as executives and support staff. Its duties include protecting federal judges, catching federal fugitives, managing and selling assets seized from criminals, transporting federal prisoners and protecting witnesses. He was U.S. attorney during the George W. Bush administration. He was the Justice Department's point person in the 42-parish Western District from 2001 to 2010. The White House announced Trump's selection on Tuesday Oct. 2. The appointment is subject to confirmation by the Senate, where Louisiana Sens. Bill Cassidy and John Kennedy, both Republicans, hailed Washington.